I once read in a book called Captivating by John and Stasi Eldridge that the decisions we make as children stay with us right through to our adulthood. I’d say this is truth for me. Up until the beginning of this year I had done my life pretty much exactly by the book. I studied Maths, Biology and Chemistry, and passed my A levels with flying colours. I applied to a range of Universities and selected to go a good University overseas. I finished my degree in Accounting and Finance and I graduated from Uni. I got a good job in a bank and then I met my Prince Charming and we got married at our childhood Catholic Church in front of all our friends and family. We travelled, we saved some money and we bought a house…and then this year, just when I thought I’d finally ticked all boxes in the “make mom and dad happy list”, my mom casually started introducing the subject of babies…ahhhhh!!! The word panic would be an understatement! The scary thing is I that I actually considered having a baby…not necessarily because I wanted one, but simply because I knew how happy it would make my parents. At that point I realised that I had a pretty unhealthy need to please my parents and whilst reading Captivating, I realised why. Disclaimer: This book is most certainly on my “must read” list especially for women, but it’s not for the faint hearted. You must be ready to go there…you know that place… the dark place you’ve put far away because you don’t want to deal with it, this the kind of book that forces you to explore your childhood, so proceed with caution. As I was saying, as I was reading this book I began to reflect on my childhood, I came along after my parents had raised three boys and that was pretty straightforward. Then they had a girl, who turned out to be a weird mix of boy and girl, she was strong-willed and didn’t take no for an answer. So after what seemed like many years of traumatic teenage years, more so for them than me, and after seeing my father almost resign at his role as dad…I decided that I had put my parents through enough and it was time for change. From that day onwards I would ony make my parents proud. Till this day, I don’t think I’ve really let go of that..Now dont get me wrong, I’m proud of everything I’ve achieved and I’m grateful for all my parents teachings and it is good to make your parents proud, but I think it is also important to know who you are and make decisions for you. So it took that baby conversation to make a decision that it was time to do me. To live for me. I’m slowly learning that it’s ok to do what you want and not feel guilty about “letting my parents down”. Whilst on the subject of guilt. I’m not sure if I’ve told you that shoes are my guilty pleasure. It’s also a childhood thing. My mom likes to tell the story of when I was about three and she bought me my first bubble gum shoes and I walked all the way to the car with my head down looking at my shoes. I would stop and pose by store windows just looking at the reflection of my shoes and I guess it was pretty much downhill from there (decisions you make in your childhood huh). After what’s felt like months without wearing heels, simply because I’ve been so busy dressing models etc, it was just amazing to put these beauties on and feel like y’all aint even ready for me! Feel good shoes. These are from Wittner, they didn’t do much damage to my coinage but yet they’re so comfortable and so striking. 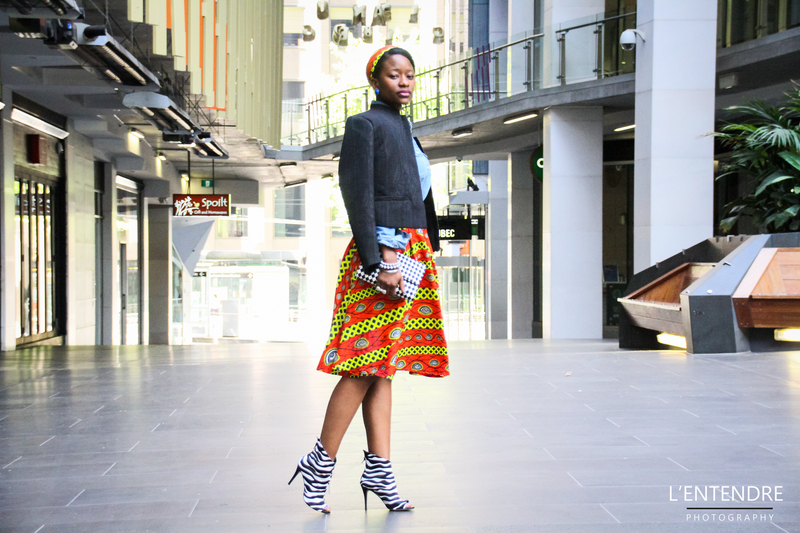 Nothing like a zebra print to give your outfit that BOOM! 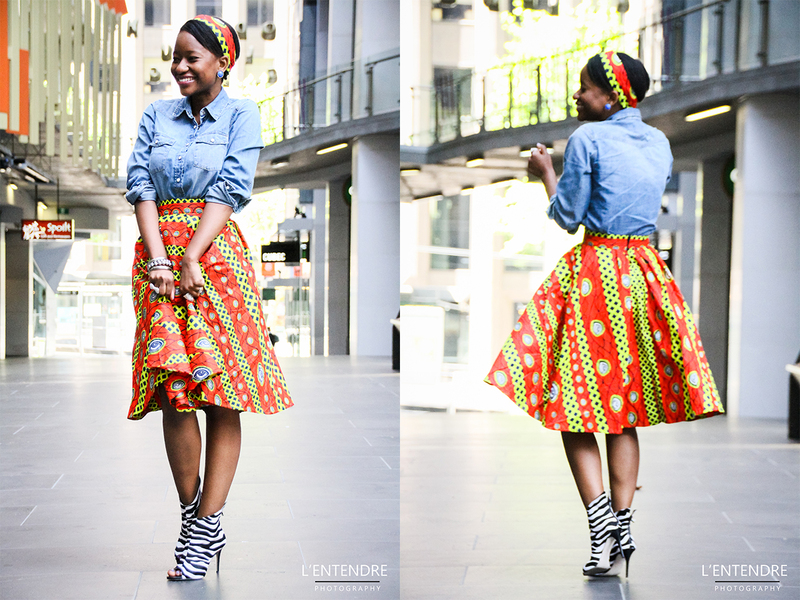 It’s all about the skirt though. 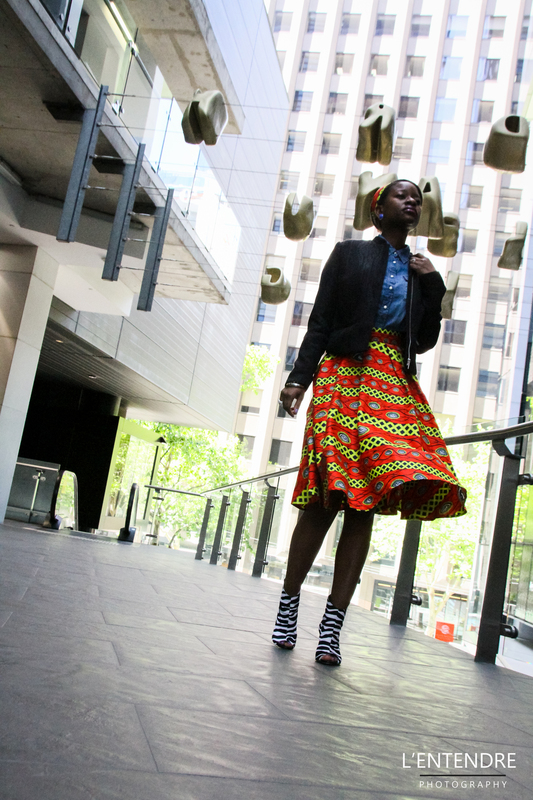 I got this skirt as a gift from a friend of mine who recently started a clothing label called Neoh Couture, all she asked for was my waist size and a week later I received this gorgeous retro A-line skirt in the mail. I love a designer who designs for her client and Neo does just that. 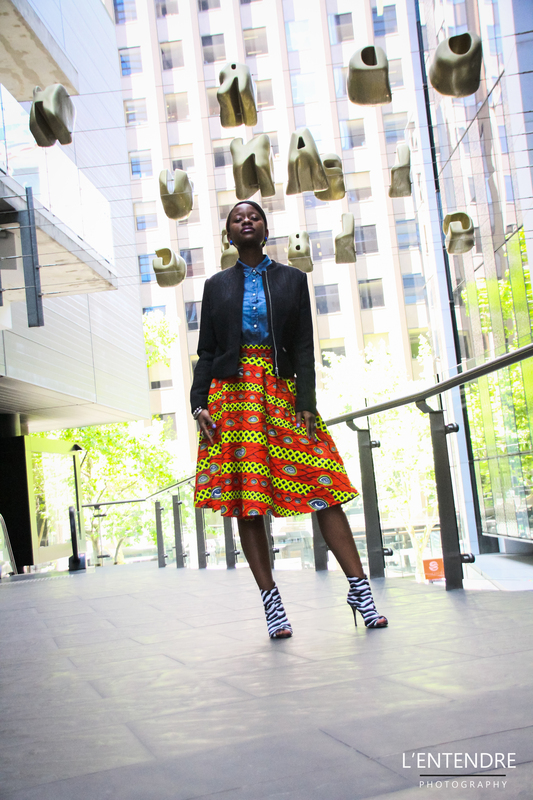 I’m so excited about our growing Zimbabwean designer network in Melbourne, and I’m looking forward to getting myself another Neo couture piece. 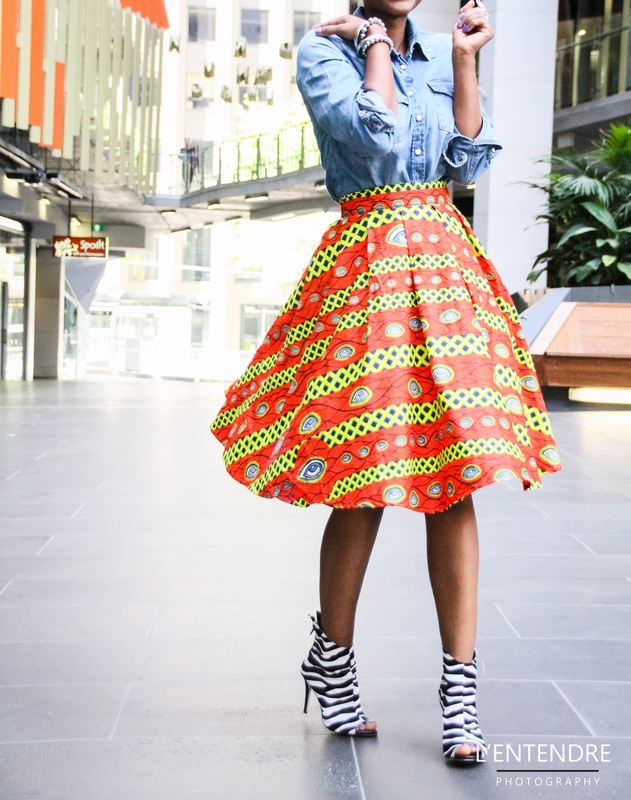 If you want one of these bright printed skirts , hola at my girl and she’ll hook you up! I’ve worn this skirt with a denim shirt, it works with the skirt but doesn’t take away from it, I also added my black bomber jacket to give my look a bit more volume and to add that extra bit of chic! Three months ago I decided to leave my comfy safe banking job… it was a tough decision, but what was tougher for me was preparing for the inevitable conversation that I had to have with my parents. If it were entirely up to me, im not sure if I would’ve had the guts to tell them. But after some initial encouragement from Tapi “just tell them babe, get it over and done with”, which then eventually turned to “babe this is awkward, if you don’t tell them I will” I decided to break the news. So I got onto the phone and began to recite my well practised speech about how I needed change and I needed some time to explore my passions, and as I finished my speech I waited to hear a long lecture about job security, and making emotional decisions, but to my surprise I got “oh..wow, I admire your courage to try something new, go for it”. Thank you Sibu!! Im glad u enjoyed reading it:) appreciate the encouragement! I hope you are well! Yes, guilty pleasure. My opinion! The Guilt is misplaced. We do deserve that special treat. We feel we should be in give mode all the time. This weeks piece brings to mind a Shona saying “Mugoni wepwere ndiye asina!” Parents always know what is best for us. We often fail to listen or read between the lines. Good job as usual. Bapa. Haha they certainly can suprise you!